Mycophenolate Medicines distributors, dealers & suppliers in Mumbai. Uses:- Mycophenolate Medicines lowers your body's immune system. The immune system helps your body fight infections. The immune system can also fight or "reject" a transplanted organ such as a liver or kidney. This is because the immune system treats the new organ as an invader. 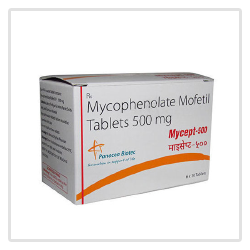 Mycophenolate is used to prevent your body from rejecting a kidney, liver, or heart transplant.Mycophenolate Medicines is usually given with cyclosporine (Sandimmune, Neoral) and a steroid medication. Mycophenolate may also be used for other purposes not listed in this medication guide. Mycophenolate available as Cellcept 500mg tablet, Cellcept 250mg tablet, Mycept 500mg tablet, Myfortic 360mg tablet, Myfortic 180mg tablet. Side Effects:- upset stomach, nausea, vomiting or diarrhea. Other possible side effects include headache, dizziness, difficulty sleeping, tremor and, occasionally, rash. These side effects usually go away with time, but tell a doctor if they persist.